Easter in Ermioni, and throughout Greece, is THE largest festival celebration of the whole year, it has far more meaning to the people than Christmas. Although Easter is predominantly a religious festival, other elements have crept in over the years to cover over a week of festivities, feasting and celebrations. 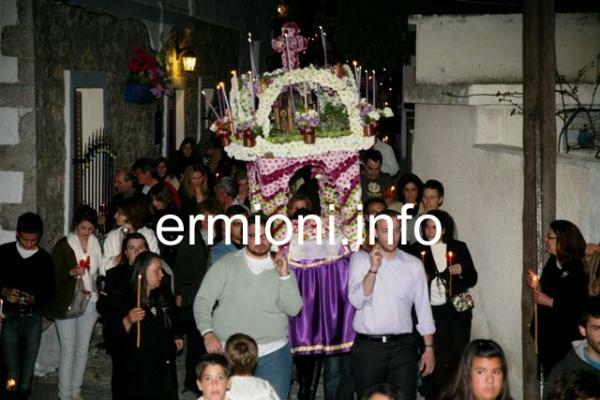 From preparing the floral biers (epitaphios) on the Thursday before Easter by the women and children of Ermioni, right through to the many family celebrations conducted in private chapels in and around the town in the week following Easter Sunday. Most people will have been fasting during the Great Lent, the 40 days prior to Easter Sunday, so from the special midnight blessings of 'Christos Anesti' everyone makes their way home to celebrate with special midnight meals, and start the preparation for the Easter Sunday family feast, for many it's usually lamb-on-the-spit. 25th April 2019 - Great Thursday, women and children from the Ermioni community, prepare the Epitaphios of Christ with fresh flowers. This is done in the Village Hall close to the Panaghia Church and in the grounds of Taxiarches Church in the Old Village. Each year, a new floral design in created for both of these floral biers, with a friendly competition to see which one looks the best. The Epitaphos are kept hidden from view until the body of Christ has been removed from the Holy Cross during the Easter service on Good (Great) Friday morning, following a Great Thursday evening church service. 26th April 2019 - Good Friday, or Great Friday, flags at home and government buildings are set at half mast to mark the mournful day. Household chores of any kind are avoided, and the tradition is that women are only allowed to colour the eggs. It is a day of lent. The morning of Good Friday, at about 10:00, a mournful church service is held in semi-darkness, where eventually the body of Christ is removed from the Holy Cross. During evening service, the 'Epitaphios of Christ' procession takes place. Both churches carry their own floral Epitaphios bier, led by a musical band, choirs and priests, with the congregation following behind carrying lighted candles. Once the procession reaches the momument at the Limani port, prayers are said. The procession then returns to the two village churches, where followers file under the Epitaphios, to re-enter their church to receive Holy bread and Easter blessings. 27th April 2019 - Easter Saturday is known as the Resurrection or Anastasis. As it is still Lent, preparations are made with the cooking of the traditional Maghiritsa, a type of soup. People start to gather in or outside the churches around 11:00 pm usually carrying large white candles. As the lights of the church are turned off before midnight, the priest comes outside with a lighted candle reciting 'Avto to Fos' (This is the light). This Holy candle is then used to light surrounding candles, which in turn light their neighbours candles, until the whole square is lit with flickering candle light. The Resurrection is proclaimed at midnight, the priest announces 'Christos Anesti' (Christ has risen) which is responded by 'Alithos Anesti' (He truly has risen). People then return home to break their fast with the traditional maghiritsa soup. If you can get home without your candle going out, you will also have a whole year of good luck. 28th April 2019 - Easter Sunday morning is spent preparing the big day's meal of roast lamb-on-the-spit, for the annual Easter celebrations. As the lamb is usually roasted on a spit outside, together with the traditional kokoretsi, it's a real opportunity for all the family and their friends to get together and enjoy the entire day celebrating with good food, wine, music and lots of dancing. During the meal, if any red dyed eggs (denoting the blood of Christ) are left over from the previous night, then they get cracked together to determine the strongest winning egg. 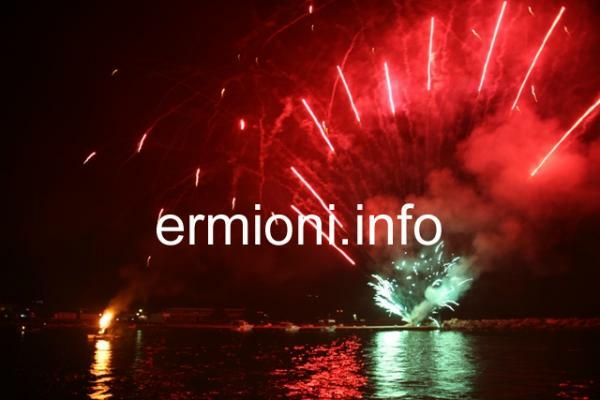 If you are planning to visit Ermioni, it is well worth considering this time of year, as many resaurants and tavernas have an Easter Feast on offer to locals and visitors alike, with some having music and dancing to follow. The people of Ermioni will give you a warm welcome during this festive Easter period, with the greetings of 'Hronia Pola' and 'Kalo Paskha'. The 'Burning of Judas' takes place at the Limani harbour front at around 21:30. Many people attend from afar, as this local custom is slowly dying out in Greece. Prior to the actual 'burning' ceremony, in previous years there has been traditional folk dancing performed by the waterfront. As the night sky gets dark, the local boat owners and fishermen sail into the main harbour around the effigy of Judas, who is positioned in the centre of the harbour. The fishermen's red flares cast a very dynamic backdrop to the whole event. 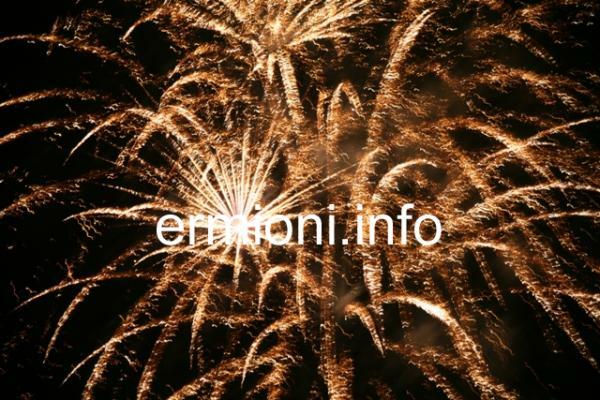 Loud dramatic music is played from the harbour side, accompanied with occassional dynamite explosions in the sea. When Judas is finally set alight, a spectacular firework display begins, a truly memorable evening of sound and light. This popular event is supported by the local Ermioni fishermen in keeping this tradition alive for present and future generations to enjoy. 29th April 2019 - Easter Monday is a national holiday throughout Greece, allowing people to relax and recover from the Easter celebrations, usually spent preparing for the return to work or school the following day. However, further Easter celebrations and festivals continue after Easter Monday. These are usually family affairs, where annual services and blessings are celebrated in private chapels, which have been in the family for generations. Most of these private chapels are on the outskirts of Ermioni or located in the rural countryside, with family and close friends that attend each year. The short intimate chapel services end with a little food and refreshments for all that attend and a chance to meet up with old friends. The Holy Week of Easter not only commemorates the crucifixion and resurrection of Christ, but is also considered by many to mark the passing of Winter to Spring. Have a "Happy Easter!" *Greek Orthodox Christians celebrate Easter at different times to the Western Catholic Easter, this is due to two main factors that cause this conflict in dates: 1) The issue with the calendars. 2) The adherence by the Orthodox faith to the early practices of the original Great Church, centred on the five ancient Patriachates of Jerusalem, Antioch, Alexandria, Rome and Constantinople. The first factor, the calendar, is that the Orthodox Church continues to follow the older Julian calendar, introduced in 45 BC, when calculating the date of Easter. From 1582, the rest of Latin Christianity started to use the new Gregorian calendar, where there is a 13-day difference between the two calendars, the Julian calendar being 13 days behind the Gregorian calendar. The second factor is that the Orthodox Church continues to adhere to the rule set by the First Ecumenical Council, held in Nicea in 325 AD, when all Christian Churches agreed to celebrate Easter on the same date. As a consequence to these two main factors, the Eastern Orthodox Church usually celebrates Paskha (Easter) later than the Western Catholic and Protestant Churches, from one to five weeks later. However, occassionally the two Easter dates fall on the same day, as in 2017.